A new idea is being floated: to use part of threatened Long Island College Hospital (LICH) in Cobble Hill, Brooklyn as "an upscale assisted living facility." 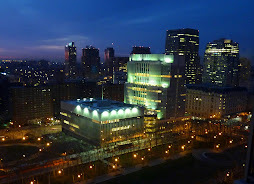 In a letter to the Brooklyn Eagle, Peter Flemming, a Brooklyn Heights historic preservationist (who was instrumental in getting the area designated as a landmark district in the mid-1960s) said such a facility, "housed on the upper floors of LICH, would work perfectly to take advantage of the hospital downstairs, the network of practitioners in our neighborhoods, the Cobble Hill Health Center down the street, and the increasingly affluent residents all across the waterfront and Downtown Brooklyn." Selling the facility to a real estate developer "would be a ludicrous waste of millions and millions of dollars spent building and rebuilding, and equipping and re-equipping this facility to be the state-of-the-art hospital it is," Flemming writes. 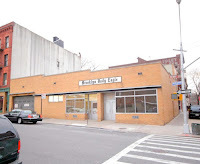 - Brooklyn's LICH On the Verge of Closing - Endowment Drained? David Wundrich -- Esquire's longtime drinks writer -- captures the essence of the new Brooklyn from the point of view of the Boerum Hill old-timer in his essay, "Regarding This 'Brooklyn' Everyone Keeps Talking About." In the old days, Wundrich writes, "The pizzeria was run by Albanians, and the Chinese takeout joint on the corner was Muslim and didn't serve pork — in fact its name was No Pork." The few delis were dirty and poorly stocked. The supermarket smelled strange. The bars were decrepit and forbidding. But somewhere along the line Alan Harding opened a restaurant, Patois, on Smith Street, and rents started rising. 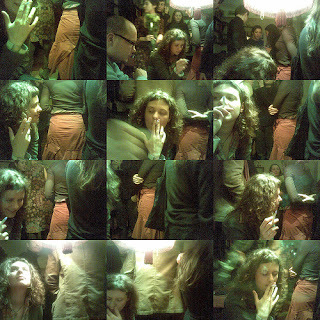 A shabby Chinese takeout joint was made over into Bar Tabac. The hookers and SROs disappeared. The old garage down the block was turned into a showroom for MakerBot. "Now you can find 'Brooklyn' anyplace in the country — in the world — where a low-rise, run-down old neighborhood has been colonized by the pickle makers and baristas, the craft shoe shiners and the mustachioed young butchers," Wundrich writes. "You can see it in Manhattan, where over the past twenty years bricks and brownstone have given way to high-rise apartment towers . . . and big-box chain stores have replaced a great number of the quirky businesses that made Manhattan such an interesting place to be." The Crown Heights Animal Hospital at 753 Franklin (a branch of the Prospect Heights Animal Hospital on Flatbush) is aiming to open this Monday, March 4, the I Love Franklin Avenue blog reports. A 22-year-old Brooklyn woman said she was kidnapped and held captive for three years in Pakistan, where she was forced to marry, according to the NY Times and other sources. She recently escaped with the help of a sympathetic relatives and the American Embassy, according to the NY Post -- but her father was caught on tape threatening to kill the relatives in retaliation. On Monday, the Pakistani police reported that two relatives of the woman had been fatally shot, and that another had been severely injured. The woman's father, Mohammad Ajmal Choudhry, 60, a yellow cabdriver, was arrested outside his home on Monday and charged with communicating threats and filing false immigration documents, according to the Times. Moscow wants to be Brooklyn -- more specifically, Williamsburg, according to the Calvert Journal, which bills itself as "A guide to creative Russia." There's Chop-Chop, a barbershop "slavishly reproducing the Brooklyn aesthetic" and the magazine/community center "Seasons Project," which profiles Brooklyn artisans and offers training to their Russian counterparts. There are a slew of clothing stores featuring Brooklyn-ish brands and vintage looks, including Fott, Engineer Garin and Chekhov. There's a vinyl shop, a cheesecake shop and even an organic produce delivery service. "Call it a response to the peculiar predicament of the creative class: too cool for the mass market, not rich enough for the luxury market, it has created an in-between micromarket whose one basic requirement is unscalability," says CJ. This is what swims in the Raritan River in New Jersey. Read all about it in the comments at Reddit, where it was first posted, and at Gawker, which freaked out about it. It was caught by arrow-fisher Doug Cutler. 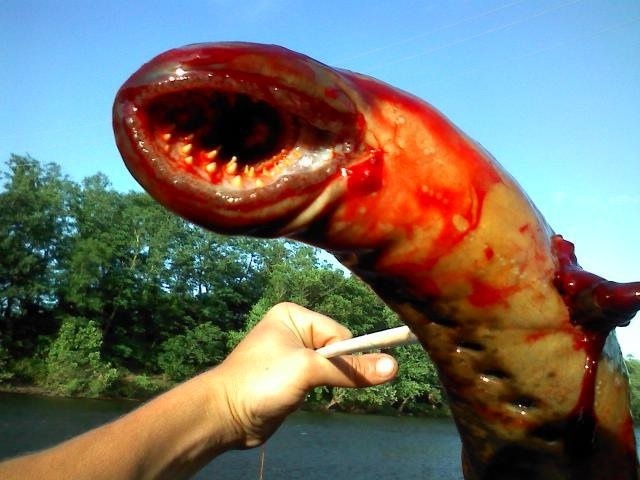 UPDATE: The NY Daily News says scientists at Outdoor magazine seem to think the creature is a very large sea lamprey, a species of parasite that lives in certain northern Atlantic waters. 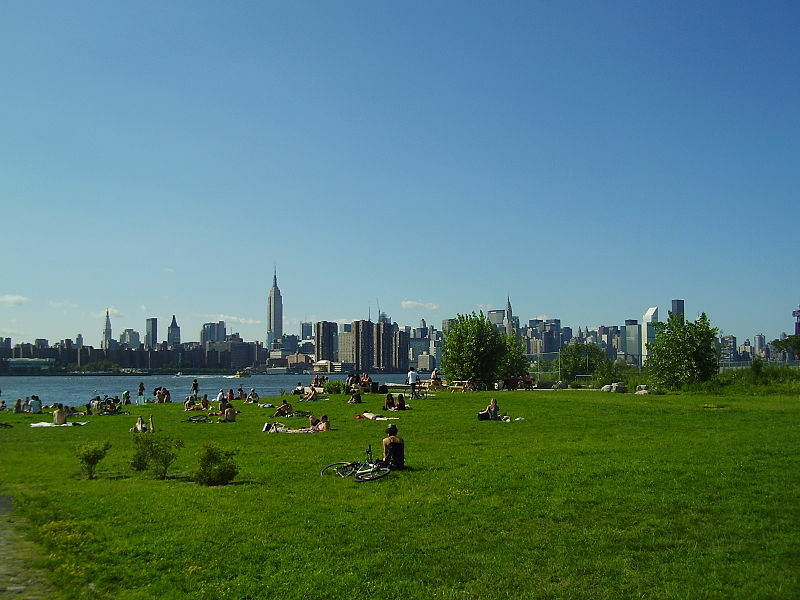 When they return this April 6, Brooklyn Flea and Smorgasburg in Williamsburg are moving north into East River State Park, according to Brokelyn. Sounds like the park is going to be getting a little busy: Other projects discussed for the park in 2013 include art installations, farmers markets and theater performances. The state is also considering installing additional equipment for the playground, areas for pets and shade structures. 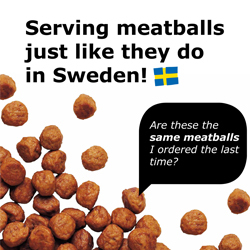 While Europe’s Ikeas have pulled the meatballs since the whole horse meat controversy, the company says the meatballs served at Ikea stores in the U.S. use domestically-sourced beef. Hey, where else can you get 15 meatballs served with mashed potatoes, cream sauce and lingonberries for just $3.99? A church service for Martha Atwater, killed tragically when a truck jumped the curb on Clinton Street in Brooklyn Heights, will be held Friday, March 1, at 3:30 p.m. at Grace Church, 254 Hicks St, Brooklyn Heights, according to the Brooklyn Eagle, which has published her obituary. Atwater, who produced such familiar children’s television shows as "Clifford The Big Red Dog," and "Goosebumps" was married to Tom Wallack and had two young daughters. Fairway Market in Red Hook, devastated by Superstorm Sandy, will be reopening better than ever this Friday morning, March 1 with a party and ribbon cutting, and everyone's invited. Fairway friends and staff will join Borough President Marty Markowitz and other politicians, Miss America Mallory Hytes Hagan, 103.5 KTU's Matt Bosso, the Brooklyn Dodger Symphony Band and others at the happy affair. While the store was closed, Fairway was a good neighbor, serving food to those hit by the storm in Red Hook, and donating food, money, and supplies. Over the last few months they have rebuilt the store with all new fixtures, lighting and cases from floor to ceiling. They've also rearranged some things to make browsing easier, and widened some aisles. "And now we're back. We love this neighborhood. We've always been there. We'll always be there," the store says in their reopening press release. New service: A Fairway shuttle picks up from 589 Prospect Avenue; or, if you live within 5 miles of Fairway, gather 10 people together and they'll pick you up at home. Demos and giveaways, 8:00 AM - 10:00 AM. 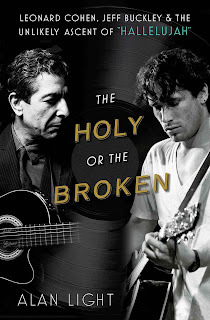 This just in from St. Ann and the Holy Trinity: Music critic Alan Light will read from his new book, "The Holy or the Broken: Leonard Cohen, Jeff Buckley and the Unlikely Ascent of 'Hallelujah,'" on Sunday, March 10, 3 p.m. at St. Ann & the Holy Trinity Church in Brooklyn Heights, corner of Montague and Clinton streets. Praised as a “masterful work of critical journalism” (Kirkus Reviews), "The Holy or the Broken" tells the story of how Leonard Cohen’s “Hallelujah” rocked an entire culture. Through in-depth interviews with its interpreters and the key figures who were actually there for its original recordings, Alan Light follows the unlikely journey of Cohen’s song from obscurity to international anthem. The reading will begin with a live performance of “Hallelujah” by the Guggenheim Grotto, an Irish folk-pop group now based in Brooklyn. First recorded in 1984, “Hallelujah” is now a pop culture staple, covered by hundreds of artists including Bob Dylan, U2, Bon Jovi, k.d.lang, Justin Timberlake, Susan Boyle, and Celine Dion. It has been featured in movies and on television shows ranging from Shrek to The West Wing. It eventually became the go-to song in times of national tragedy, chosen by VH1 for its official post-9/11 tribute video, and most recently by The Voice in tribute to the victims of Sandy Hook. Alan Light is a frequent contributor to the New York Times and Rolling Stone, and former editor-in-chief of Vibe and Spin magazines. Copies of The Holy or the Broken will be availablefor purchase and signing at the reading. Suggested donation $10. Ann & the Holy Trinity Church at 718-875-6960 or office@stannholytrinity.org or visit www.stannholytrinity.org. Emmy-award winning TV writer Martha Atwater, 48, had just bought five cookies and exited Bagel Cafe in Brooklyn Heights Friday evening when the driver of a black Honda pickup truck jumped the curb and killed her. 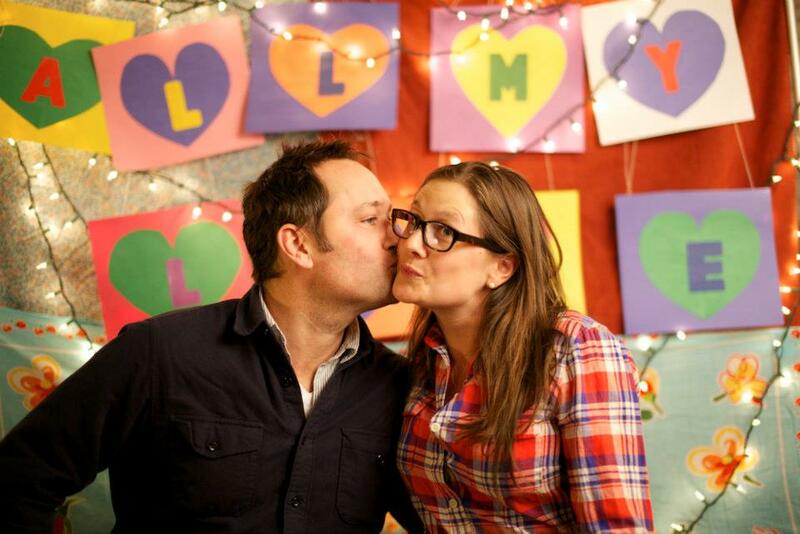 Atwater was beloved in Brooklyn Heights as "an amazing human being, an adoring mother, a witty and wise friend." UPDATE: The Brooklyn Eagle has published Atwater's obituary and schedule of services. More at the NY Post, DNAinfo, and the BHB. 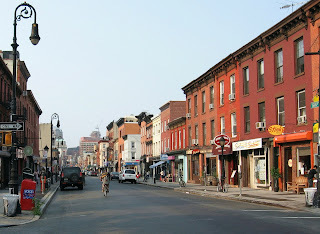 Public Advocate Bill de Blasio said on Thursday that New York City business inspections and fines disproportionately hit small businesses in the outer boroughs (and Manhattan above 96th Street to a lesser degree). 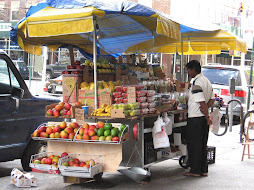 De Blasio's report, "Borough Bias: How the Bloomberg Administration Drains Outer Borough Businesses," takes a look at fine-related data de Blasio secured through a lawsuit against city agencies. Compared to the citywide average, businesses in Brooklyn are inspected by Consumer Affairs four percent more frequently. Businesses in Manhattan receive 14 percent fewer inspections than the citywide average. Brooklyn businesses pay five percent more Consumer Affairs fines on average. Of the 10 neighborhoods with the highest rate of health violations per restaurant, six were in Queens and four were in Brooklyn. In a release de Blasio said, "This spike in inspections, fines and violations coincides with failing city revenues as a result of the Great Recession." 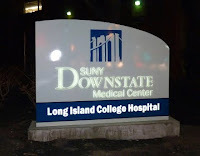 SUNY Downstate has submitted a closure plan for Long Island College Hospital (LICH) to the state Dept. of Health, but they refuse to let anyone see it, according to the Brooklyn Eagle. "The press hasn’t seen it, no one has seen it, Downstate isn’t making it public," said Eliza Bates, a spokesperson for the New York State Nurses Association. In the meantime, the temporary restraining order has made Downtown-area officials, civic leaders, patients and staffers very happy. More here. 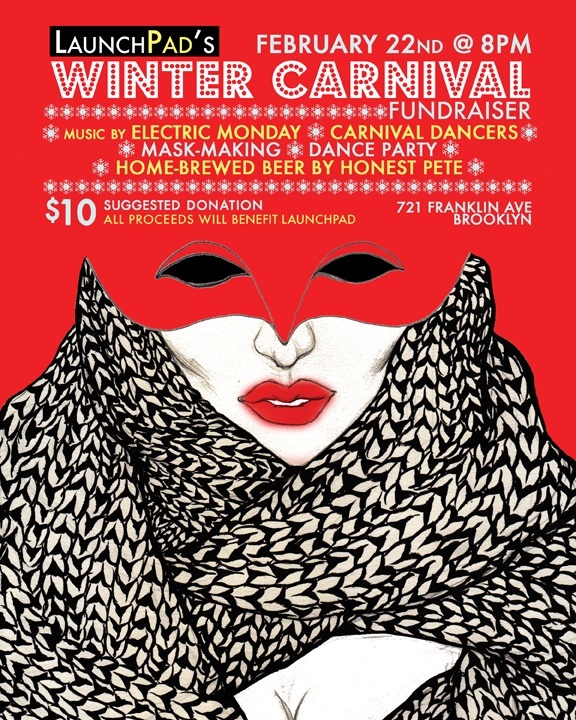 I Love Franklin Avenue brings word of a weekend's worth of events at LaunchPad in Prospect Heights, including the Winter Carnival Fundraiser tonight (Friday) with live music by Electric Monday, a mask making table, home-brewed beer by Honest Pete, and costumes and dancing encouraged. NBC.com has been hacked, and if you visit the site the odds are your computer will have malware installed -- so don't even think about it! For more details visit Gawker. Facebook may not have to pay any taxes this year but we do -- and it's a toss up between this or the dentist as to which we'd rather do. We have papers covering the dining room table and we're trying to find some records that would clear up that little problem from last year . . . Sorry if we can't run out and take pictures for a day or two . . . Our productivity is totally screwed. 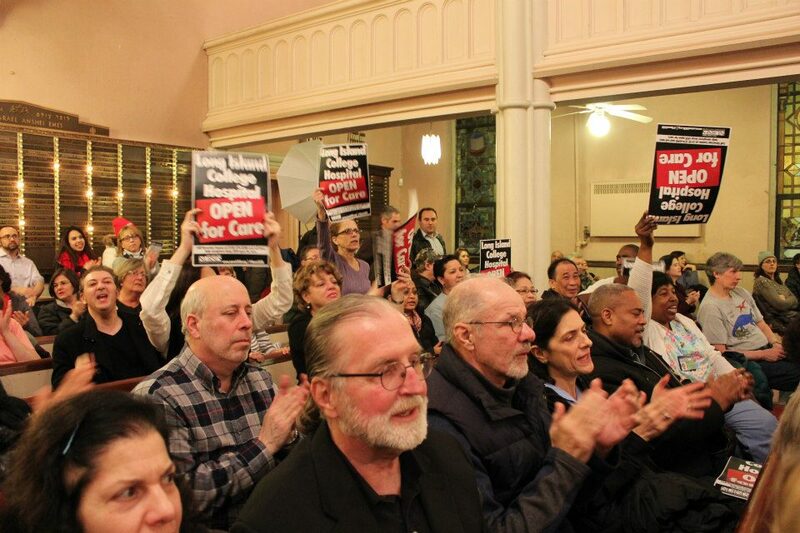 The Kane Street Synagogue in Cobble Hill was filled on with doctors, nurses, reps and locals on Thursday, all working to save Brooklyn's Long Island College Hospital (LICH). 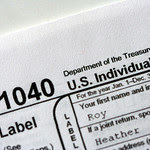 Organizers urged citizens to call and write letters to Gov. Andrew Cuomo and the Health Department, as well as Dr. Nirav Shah, the NYS Department of Health’s commissioner, according to the Brooklyn Eagle. More photos at NYS Nurses Association. Want to recreate the Russian meteor hit? You can use Purdue University's "Impact: Earth!" online program to run various impact scenarios and see what would happen if an asteroid or meteor crashed into the Earth near Brooklyn. This simulation lets you vary the size of the meteor or asteroid, its density, degree of impact, speed of flight, the distance (you are) from impact and what the meteor crashes into. The program then tells you what happens at various distances from the place of impact. We tried the program out by simulating a meteor 55 feet across, like the Russian meteor. Less dense meteors didn't have a dramatic effect, so we made ours of high-density iron, and had it coming in at an 89 degree angle at a fast speed (71 km/sec) hitting rock. The air blast arrives 28.7 seconds after impact. Maximum wind velocity is 210 mph. Sound intensity is 93 dB (causing ear pain). Multistory wall-bearing buildings collapse; wood frame buildings collapse almost completely. Glass windows shatter. Up to 90 percent of trees blow down; the remainder are stripped of branches and leaves. That scenario is not the end of the world -- though it would be the end of much of Brooklyn. A much larger meteor, however, would be. To feed our need for visual stimulation, we found the above realistic simulation of a 300 mile wide asteroid striking the Earth, as depicted in "Miracle Planet: The Violent Past." Wear multiple layers and thick gloves because it's cold out there, the National Weather Service says. A Hazardous Weather Outlook is in effect in Brooklyn and the surrounding New York City areas for Sunday night and into Monday morning. A Wind Advisory is in effect until midnight, with strong winds and gusts just over 45 mph, bringing down branches. After midnight, temperatures will drop to 15 - 20, and wind chills will be around or below 0. Brrr! CBS News is reporting that a meteor blasting above Russia's Ural Mountains on Friday morning, caused sharp explosions and injured more than 400 1,200 people. "There was panic. People had no idea what was happening. Everyone was going around to people's houses to check if they were OK," said Sergey Hametov, a resident of Chelyabinsk, about 1500 kilometers (930 miles) east of Moscow. The meteor hit less than a day before the asteroid 2012 DA14 is to make the closest recorded pass of an asteroid -- about 17,150 miles, CBS notes. But the European Space Agency says there was no connection. UPDATE: A three alarm four alarm fire broke out at Pratt Institute, Willoughby and Washington Avenues in Brooklyn at about 2:21 a.m. Friday morning. According to FDNY, flames were shooting through the roof. 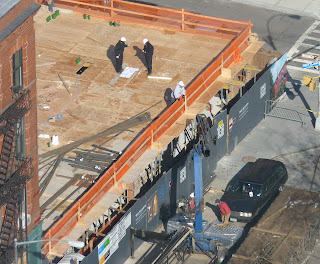 We shot this photo from far away in Brooklyn Heights. 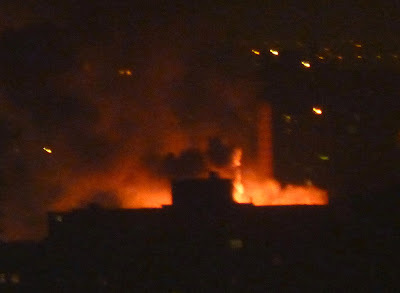 UPDATE:According to the Brooklyn Eagle, the fire is in the Main Building. Katie D. says "artwork is demolished." UPDATE: The fire is under control and no injuries have been reported, thank goodness. Tons of Valentine's events in the Greenpoint area here. We're told the Sunday Suppers have been very popular. The next one, featuring dishes by Chef Annie Berger takes place March 3, from 7-9pm at Diamond Bar (43 Franklin St). 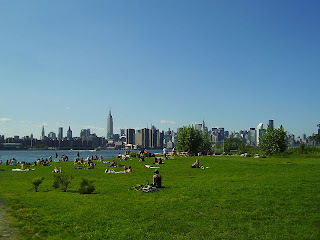 - Fodors tells you Where To Eat In Brooklyn Now. It's not construction, information or real estate -- it's the healthcare and social assistance fields (shown in green in the chart below) that provide the most employment in Brooklyn, followed by retail (shown in black). Figures released by the U.S. Bureau of Economic Analysis show that in 2009, there were 183,009 healthcare and social assistance jobs in Brooklyn; in 2010 it was up to 191,838; by 2011, there were 198,152. Not all possible fields are shown on this chart -- the software limited us to 10 at a time, so we picked those with the most workers and those with the most relevance to Brooklyn, including real estate and information. Note: If SUNY succeeds in closing down Long Island College Hospital, there will likely be 2,000 fewer health care jobs in Brooklyn in 2013. 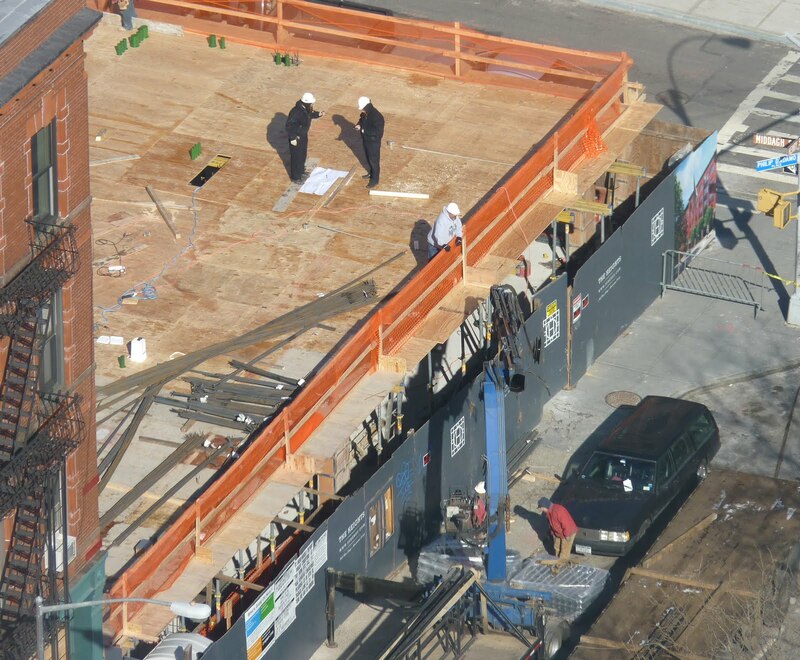 Before the snow hit this past weekend builders put a plywood roof on the deep pit dug at 30 Henry Street in Brooklyn Heights, the site of the past home of the Brooklyn Eagle newspaper. The project will eventually be a 5-story condo. It's design was called "boring" and “a mishmash of contextualism" by the Brooklyn Heights Association. Senator Daniel Squadron's office reminds us that a Community Forum about LICH will take place on Thursday, Feb. 14th from 6 - 8 p.m. at the Kane Street Synagogue at 263 Kane Street (between Court and Clinton) in Cobble Hill, Brooklyn. The meeting will center on how the community can work together to save the hospital, said to be worth more dead than alive to SUNY Downstate. This forum is sponsored by the Cobble Hill Association, Brooklyn Heights Association, Carroll Garden Association, Kane Street Synagogue, New York State Nurses Association, and 1199 SEIU. For more information contact Michelle Green at 718-714-8863 or michelle.green@nysna.org. 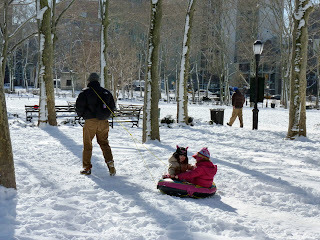 The Brooklyn Eagle live tweeted the annual meeting of the Brooklyn Heights Association. A host of topics were discussed -- the closing of LICH (Long Island College Hospital), the closing of the Heights branch library, bike share, post office cuts -- and community service honors were handed out to several deserving folks. Congresswoman Nydia Velazquez said about LICH: "We had a meeting with Carl McCall where he promised us he will come back with a plan [to provide] some type of health care services to the community" after LICH closes." The Eagle's tweets are here, and the paper says the full report will be published Tuesday. Cadman Plaza Park in Downtown Brooklyn was filled with thousands of supporters of striking school bus drivers on Sunday. 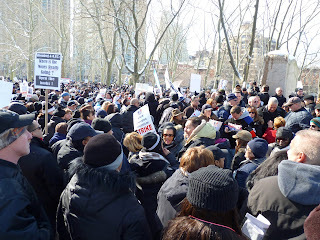 They rallied in the park and marched across the Brooklyn Bridge to City Hall. Drivers and many parents are unhappy with Mayor Bloomberg's push to eliminate seniority for long-time bus drivers of special education kids. Parents worry that inexperienced drivers will replace those with years of experience taking care of kids in wheelchairs, with autism and other medical problems. Long-time drivers say Bloomberg's plan will throw them into poverty. 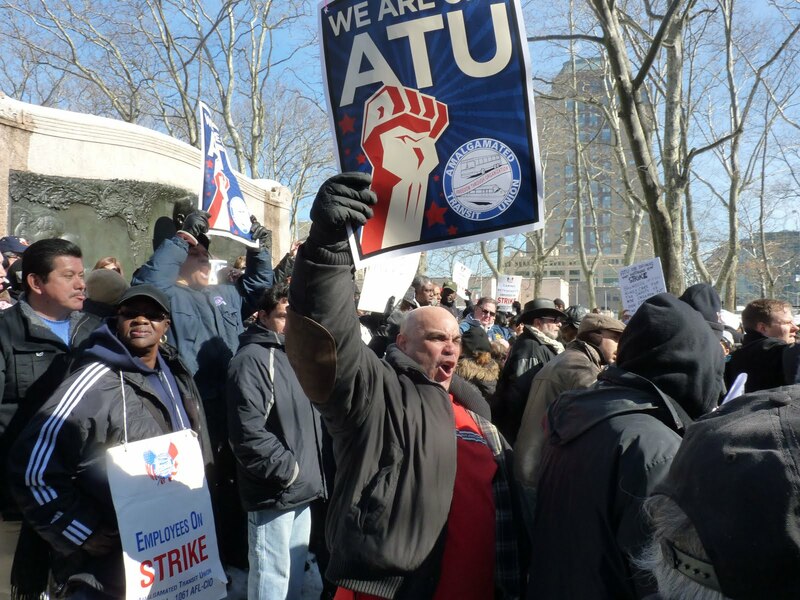 Marchers included Amalgamated Transit Union, New York Communities for Change, and Parents to Improve School Transportation. LICH and Interfaith nurses rally in the sleet on Friday. Long Island College Hospital (LICH) and Interfaith Hospital nurses, doctors and staff rallied outside Brooklyn Borough Hall in the freezing rain and sleet on Friday morning -- but were broken-hearted after learning the SUNY board voted to close LICH after Thursday's sham hearing. The Brooklyn Eagle reports on what went on at the Brooklyn Health Care Crisis hearing after Friday's vote. 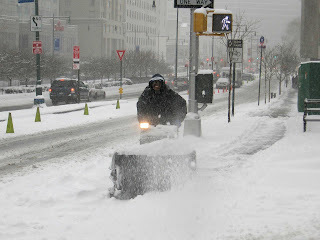 The great blizzard of 2013 (named Nemo, which means "no man" or "no one" in Latin ) could be starting earlier than previously predicted -- the National Weather Service has set the blizzard alert for New York City to run from 6 a.m. Friday to about 1 p.m. Saturday. The weather service is forecasting from 10 - 14 inches of snow and winds of 15 to 25 mph with gusts up to 45 mph in Brooklyn. Pretty much everything has been cancelled -- planes, trains, and yoga classes. After some initial snow, freezing rain will probably make everybody miserable from 4 - 8 p.m. Friday, and cause some flooding along the waterfront areas. Tides will be 2 - 4 feet above normal. Don't be fooled: The strongest wind and snow will come Friday evening and night, and early Saturday. Don't drive! The weather service warns of near whiteout conditions. And DO NOT walk under snow-laden trees, as limbs will be falling. 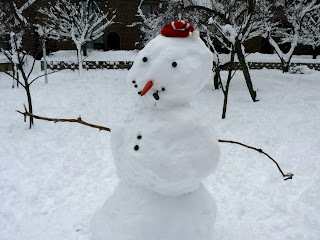 HAVE A WINTER SURVIVAL KIT WITH YOU. IF YOU GET STRANDED...STAY WITH YOUR VEHICLE. Dress warmly for the LICH protest at Brooklyn Borough Hall this morning! 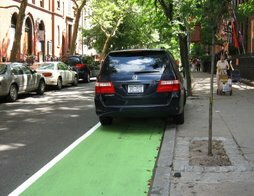 More facts about parking, Con Ed, etc. here. Brooklyn's representatives hammered SUNY Chairman Carl McCall at the sham SUNY board of trustees hearing today, staged as a prelude to closing down Long Island College Hospital (LICH) and stripping it of $500 million worth of real estate. Councilman Brad Lander asked SUNY Chairman Carl McCall if SUNY's acquisition of LICH in 2011 was a transaction driven by real estate, the Brooklyn Eagle reports. Lander demanded: "Will you commit to us that you will not sell off the real estate?" 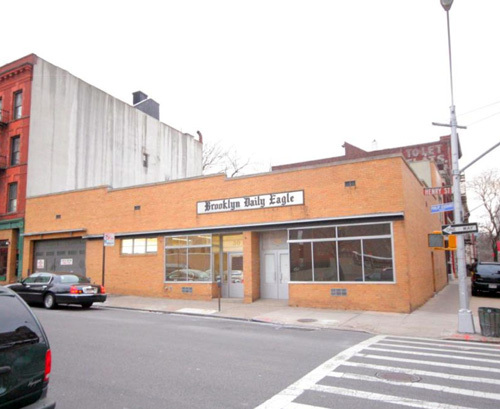 McCall declined, saying "disposition of LICH's real estate was not on the board's agenda." "If you close LICH now, you will be abandoning a 150-year-old investment in Brooklyn’s health care infrastructure, which we will never be able to recreate anywhere in the vicinity of downtown or brownstone Brooklyn. Many recent events have shown the need to maintain and invest in our infrastructure. You would be doing the opposite – selling off essential infrastructure for cash, rather than investing in it. This unfortunately raises the very real question of whether SUNY Downstate ever really intended to turn LICH around." 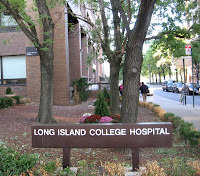 "Now that we are faced with a plan that essentially turns this $63 million state grant into a subsidy for a massive real estate deal, it should be no surprise that the community and state feel looted," said Squadron, referring to the HEAL New York grant awarded to LICH and Downstate when the two institutions merged in October 2010. Squadron also disputed claims that LICH's bed occupancy is below capacity. "Making it impossible for LICH to be a 500-bed hospital, then shutting it down because it isn't one, is Orwellian," he said. - Sen. Eric Adams suggested there be a probe of possible "criminal action" in the removal from LICH coffers of millions of dollars bequeathed to the hospital by a local benefactor. - At one point Williams even claimed to be unaware that LICH's dialysis center was told to stop accepting patients and to vacate. - This afternoon the SUNY board pretended to give serious consideration to the points made by Brooklyn reps and residents and voted on closing LICH. - On Friday morning SUNY will announce its final decision. A march, press conference and community meeting will be held at Brooklyn Borough Hall Friday morning. 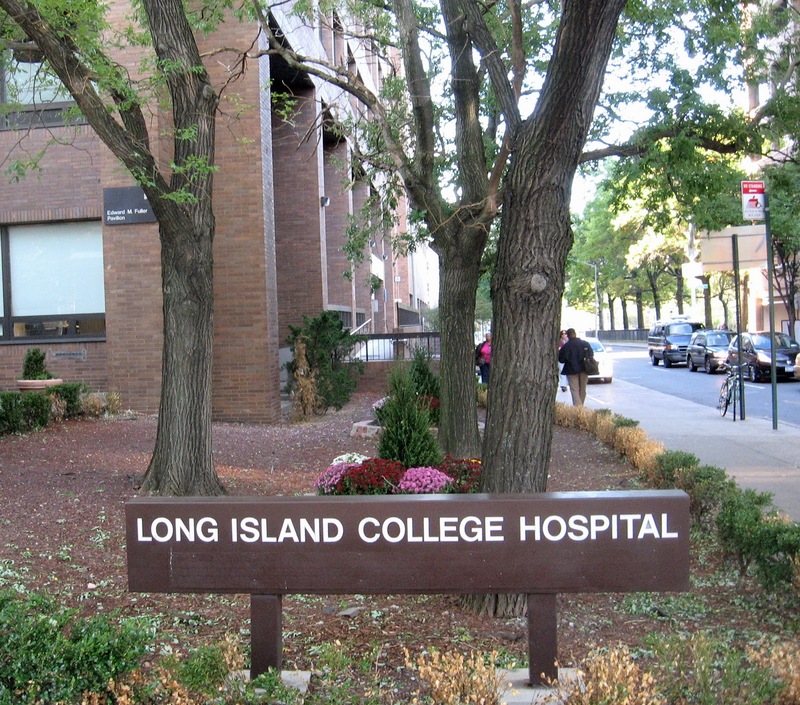 - Residents, nurses, and local representatives will be rallying in support of keeping LICH (Long Island College Hospital) open today before the 3 - 5 p.m. public hearing of SUNY's board of trustees. - The public hearing will take place at the School of Optometry, 33 W. 42nd Street in Manhattan. 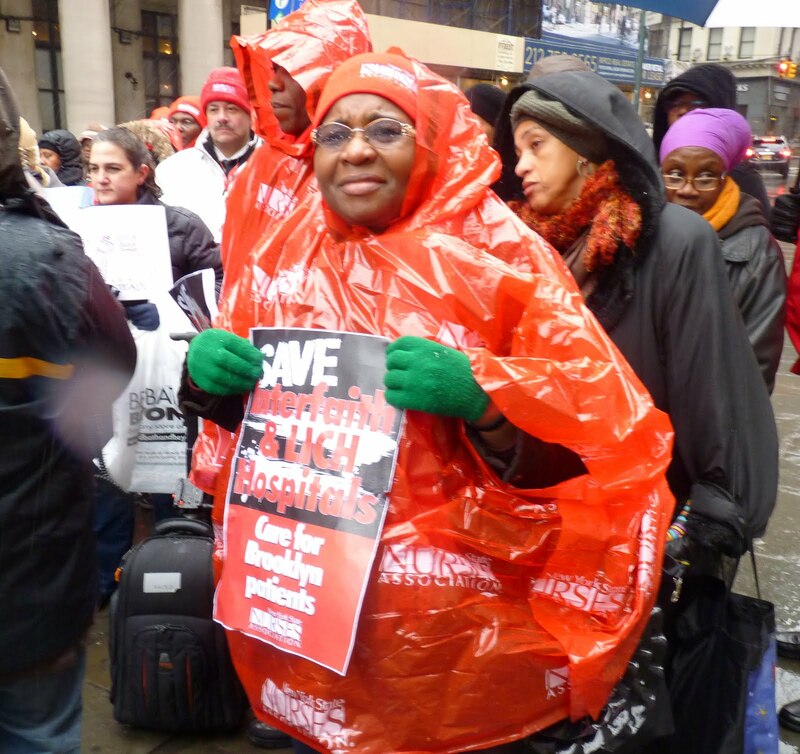 - SUNY Downstate President Williams will recommend closing LICH to save Downstate. - The public comment period starts at 3:30 p.m. This is the last chance for supporters of LICH to make their cases to keep it open. If you want to speak but haven't registered, you have to show up before 2:30 p.m. and sign up. If there's time, you'll be able to speak 3 minutes. - After the meeting, the SUNY board will pretend to give serious consideration to the points made by Brooklyn residents. - A vote will take place. - On Friday morning SUNY will announce its final decision. A press conference and community meeting will be held at Brooklyn Borough Hall Friday morning. - LICH doctors and nurses will start flooding competing hospitals with resumes. - The state Health Department will mull over the hospital's closing procedure application. - LICH could close as soon as March, depending on how long Health Department takes to approve closing plan. Get your carrot noses and cute button eyeballs ready -- the National Weather Service has issued a Winter Storm Watch for Brooklyn, New York City and Long Island from Friday evening through Saturday morning. Right now the prediction is for from 4 - 10 inches of snow, winds from 25 -35 mph with gusts up to 60, and temperatures in the low 30s. Be careful driving - visibility will be less than a quarter mile at times. * TIMING...FRIDAY EVENING INTO EARLY SATURDAY MORNING. AND CAUSE SCATTERED POWER OUTAGES. If you were awakened by a low-flying helicopter over Brooklyn Heights from about 2:15 - 2:35 a.m., here's what we heard on the police scanner. Police Aviation: "We're flying over rooftops and fire escapes." "A male on a fire escape trying to gain entry. Stay vigilant." UPDATE: The New York Times, the Post and the Brooklyn Eagle are all reporting that the SUNY Board of Trustees has decided to close Long Island College Hospital -- LICH -- even before Thursday's sham hearing. Hospital staffers were told late Tuesday. SUNY's Board of Trustees were scheduled to hold a special hearing on Thursday afternoon regarding the fate of LICH, with a public comment period starting around 3:30 p.m. The hearing is obviously a sham -- since the decision was made months ago, the Brooklyn Eagle reports.